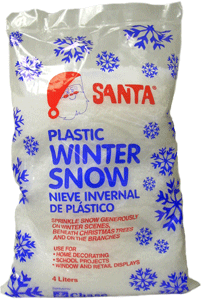 Santa® Snow Frost creates a powdered effect. Designed especially to decorate large windows, mirrors, and other glass surfaces. While more opaque than Ice Crystals, it allows light to filter through. Use with Santa® Christmas Stencils. Quick, easy cleanup with a damp paper towel. Use both indoors and outdoors on windows, mirrors and other glass surfaces. Test before using on plexiglass, plastic or painted surfaces.